PUZZLE - Here we have four empty tanks with equal air pressure and a tap that will pour water at a steady rate into the top tank. Assuming all variables remain the same which of the tanks will fill up first? Here we have four empty tanks with equal air pressure and a tap that will pour water at a steady rate into the top tank. Assuming all variables remain the same which of the tanks will fill up first? 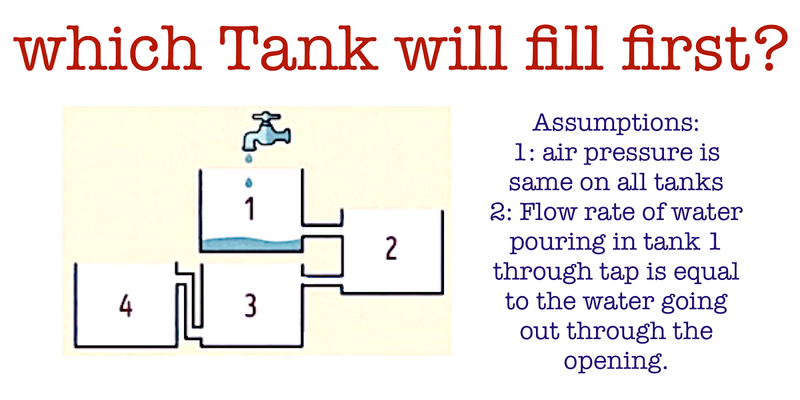 Since tanks and have level openings at the bottom of the tank, the water won’t have the chance to fill until the adjacent tank is full. That leaves 3 and 4. Seeing 3 as how also has an opening at the bottom one may assume the same rule applies. Well does it? Not at all! Answer: Because the water has to move up to get from 3 tank to 4, tank 3 will be able to fill while 4 does. In fact the two tanks will wind up filling at the same time giving you your answer.